Maria's Space: The Lotus Trolley Bag Giveaway! 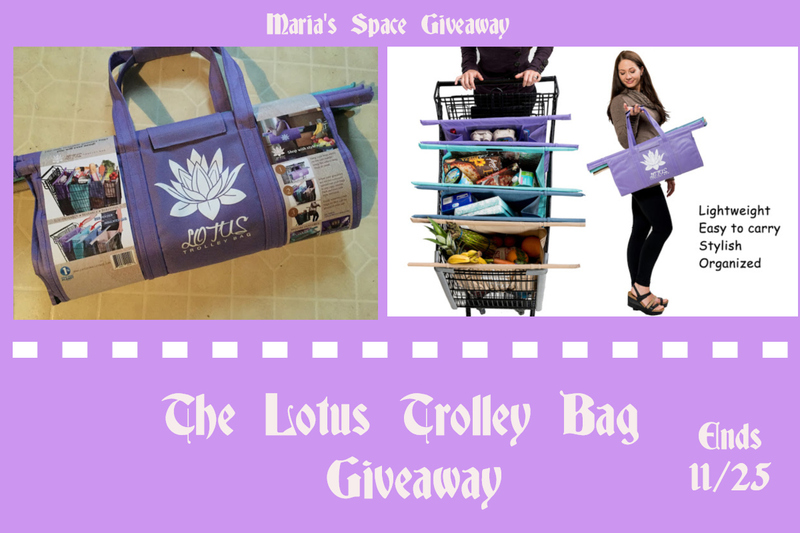 The Lotus Trolley Bag Giveaway! The Lotus Trolley Bag is not just another environmentally friendly shopping bag—rather, it’s an altogether new bagging system that can transform our shopping carts into our own personal assistant! These bags save steps—time and energy, all the while eliminating millions of wasteful, harmful plastic bags from our environment. 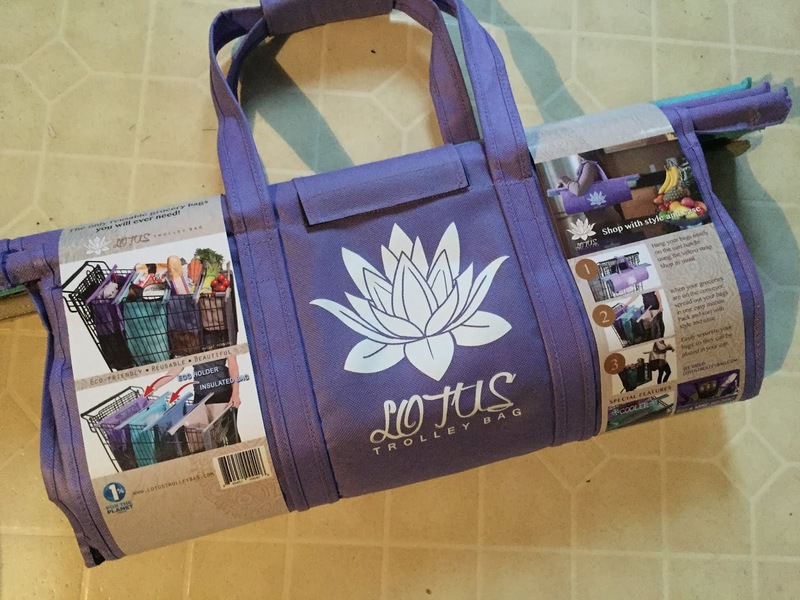 Lotus Trolley Bag was started by a husband and wife doing their part to help our beautiful planet. Not sure about where you are but starting next year many of the stores in my area will be charging for plastic bags that you use in their store. I am okay with that since we love using our canvas bags but The Lotus Trolley Bag is completely different. It folds nicely and has a handle for easy carrying. It also comes with 4 large, canvas bags that hook onto your cart including an insulated bag for frozen items and pockets for egg cartons or bottles. My family has used The Lotus Trolley Bag for 3 weeks and love it! 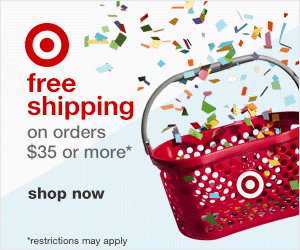 We place them easily in our cart and fill them up. Once we get to the register we empty them and put the groceries right back in them. It took some time because we were use to bagging as we were putting things on the conveyor belt. Now we just empty each bag and fill as the cashier rings the items up. 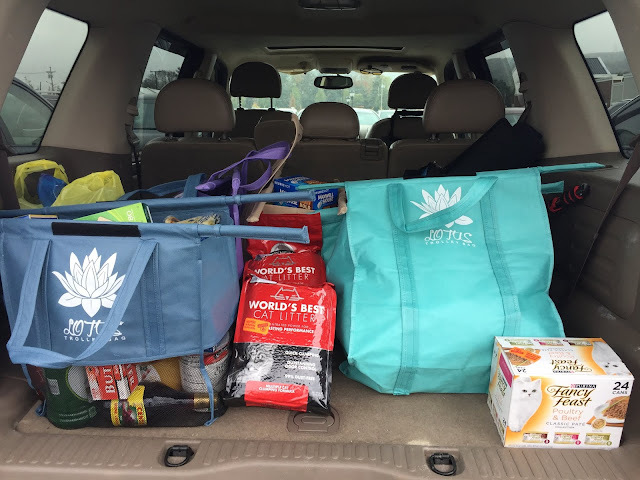 When we get back to the car, we just place the four bags in the car instead of 10 small plastic bags that spill all over my truck as I drive. Then we just lift the bags out and take them in. It is wonderful because instead of 5 trips from the car to the house, we do it in 2. 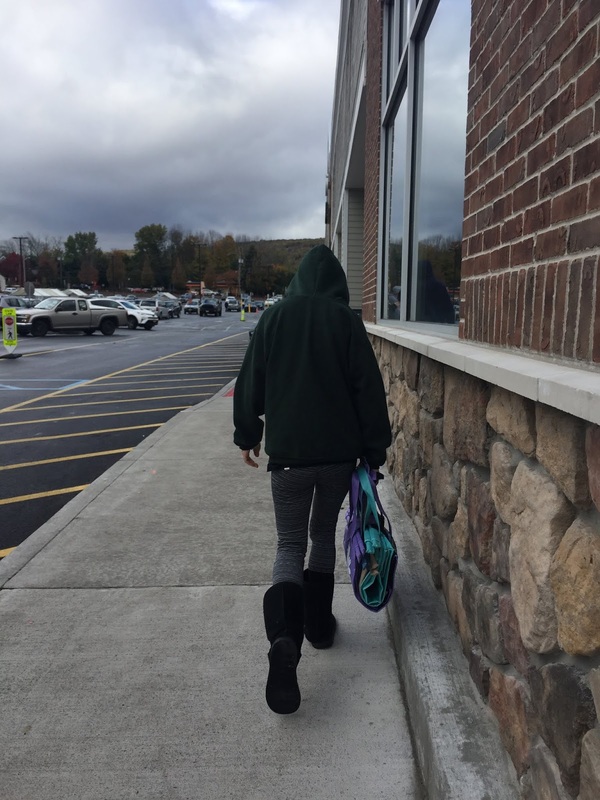 There is an insulated bag for frozen items. The bags all Velcro together so you are not grabbing a bunch of bags, it is like 3 in 1. Each bag has reinforced stitching so they won't break due to the weight of your groceries. The bags are washable. just remove the rods and toss in the wash.
You can even use the bag alone without the rod if you need a really large bag making them very versatile. I wish they didn't stick out so far. I understand it is so the bag doesn't fall as you place things inside it and so that it will fit many different size carts but I worry that I am going to hit someone when I go by. They are much wider than the cart. A hook that wraps around the cart would make more sense so I don't catch on anyone as I shop. I absolutely love this bag! 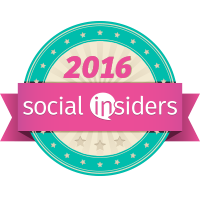 Fingers crossed I win! I like these bag -- look good and I like how they fit in the cart. Nice color and lotus on the bag, vry useful! Very nice color and size! This a very unique way to grocery shop and I love it, it would make it so easy to carry your groceries especially up stairs like I have to do without worrying about the plastic bags breaking. What a great way to go shopping, keep your food organized, stop using plastic bags, and make it easier to transport, and put away groceries when you get home! I love that it has 4 large canvas bags in different colors, one being an insulated bag. This will make shopping so much easier as you can fill bags as you shop, take the items out to ring up at register and then put everything back into the bags in your cart. 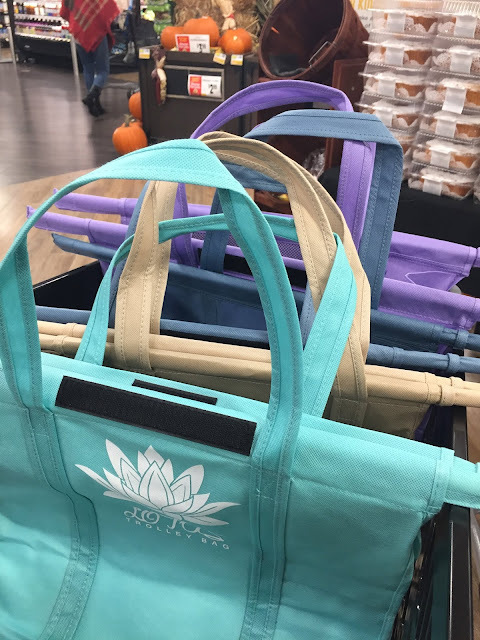 I have a shopping bag (just one, not a set) that is supposed to perform a similar function, but I think I would prefer the shape of Lotus bags and the way they are constructed to stay open. The one I have sort of scrunches up which makes it a pain to try to put things inside it. however, like you, I think I would also be annoyed with how far they stick out of the cart. I guess I would have to use them before I could determine which bag is better! I love the size of it and all that it would hold. This would be very useful when I am out shopping and running errands. I do like the sounds of these trolley bags for taking along when I go grocery shopping. And it would be much easier to carry in all of the groceries too. The Trolley bag would be a huge help when shopping! I love it! I think it would be extremely useful. Would be super handy for my weekly grocery shopping.